Top: Cropped cashmere sweater – rare (gacha) by Ec.cloth for The Epiphany. Bottom: Kendall chinos – rare (gacha) by Ec.cloth for The Epiphany. Shoes: Mocobo fat (gacha) by Tomoto for Pocket Gacha. Choker: Velvet knotted choker #3 (gacha) by Ec.cloth for The Epiphany. Clara necklace by Realevil Industries. Rings: Precious set by Realevil Industries. 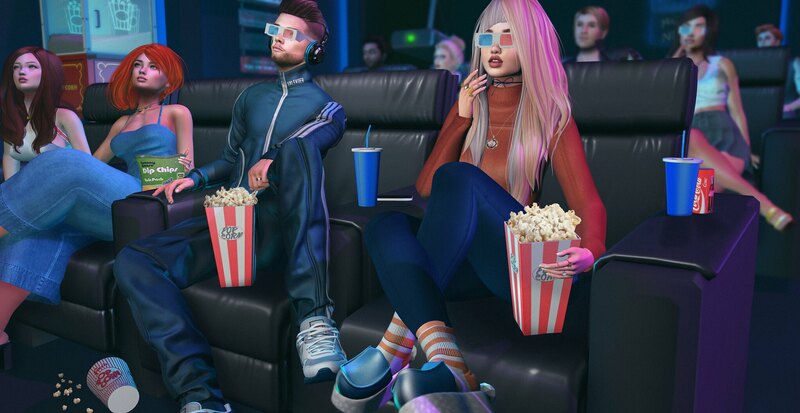 3D Glasses ‘movie night’ (gacha) by Bad Unicorn for The Epiphany. 4 Person neon sofa ‘movie night’ (gacha) by Bad Unicorn for The Epiphany. Popcorn ‘movie night’ (gacha) by Bad Unicorn for The Epiphany (picture edited). Blue drinks cup ‘movie night’ (gacha) by Bad Unicorn for The Epiphany. Popcorn machine ‘movie night’ (gacha) by Bad Unicorn for The Epiphany. Home theatre skybox rare (gacha) by Bad Unicorn for The Epiphany. Ladies top debbie by GAS Clothing. Ladies skirt janina by GAS Clothing. Left hand: VR crown ring by RedMint. Alliance: Luxe ring wedding eternel by Ysoral. Chocolate candy bar by TBF – free on MP. Skate: “BRAP” sail longboard by Bad Unicorn.